Yes, as if it wasn’t bad enough that the lure of the charity shops keeps increasing the amount of volumes making their way onto Mount TBR, this week has seen the arrival of a few extras in the form of a couple of books I’ve ordered and one lovely gift! The George Konrad book is one of the Writers from the Other Europe series which I’ve been gradually collecting – it sounds like strong stuff, so I shall have to be in the right frame of mind to read it. The Lawrence Durrell was an online impulse purchase following a lovely article about it in the “Slightly Foxed” magazine – and after a quick look at the first pages I can see that the prose is gorgeous so I hope this one will be a winner. 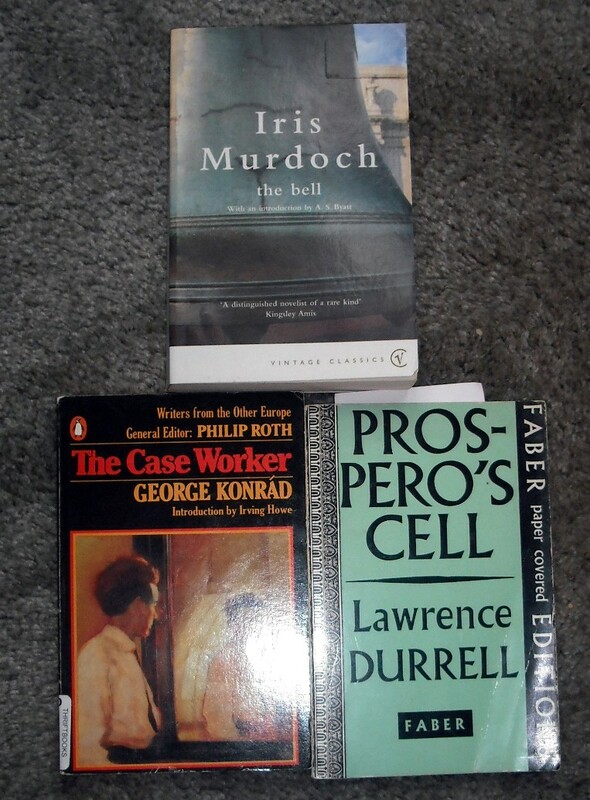 And finally, a lovely gift from my lovely long-time friend J in the form of Iris Murdoch’s “The Bell” – I have a couple of Murdochs on Mount TBR and this can join them, as it’s title I’ve often considered reading. J, who shared a wonderful visit to the Persephone Shop with me, spotted this in a charity shop and very kindly picked it up for me – what a lovely friend!